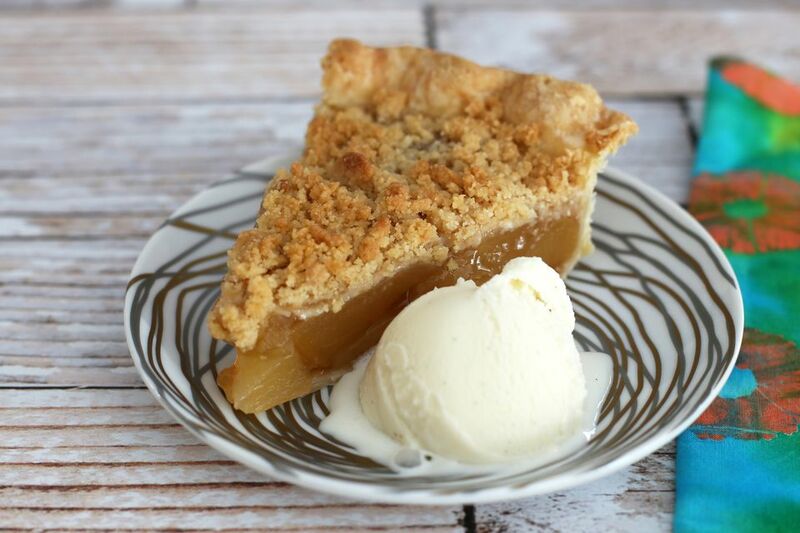 The butter and brown sugar crumb topping takes this awesome apple pie to another level and it is one of the most popular apple pies in my recipe collection. Not only is this an incredibly delicious apple pie, it's super easy to fix and bake. The pie shell can be made with your favorite homemade pastry or a convenient frozen or refrigerated crust. The buttery brown sugar crumb mixture takes the place of a top crust, eliminating that extra chilling and rolling. If you are looking for shortcuts, use 2 cans of apple pie filling, a frozen or refrigerated crust, and the easy crumb topping in the recipe below. A home baked apple pie doesn't get easier than that! In a large bowl combine the flour, brown sugar, salt, and butter; blend with your fingers or a pastry blender until crumbly. Set aside. In another bowl combine the apple slices, granulated sugar, and cinnamon; mix gently to coat apple slices. Pack apple mixture into the chilled crust. Sprinkle the crumb topping evenly over the apple filling. Bake in the preheated oven until the apples are tender, about 40 to 50 minutes. Check the pie and cover the crust edge with a pie shield or homemade foil ring, if necessary, to prevent excessive browning. Serve this apple pie with vanilla ice cream or a big dollop of whipped cream. Caramel sauce would be delicious drizzled over the pie! Oat Crumb Topping - If you prefer a brown sugar and oat topping, replace crumb mixture above with 3/4 cup of all-purpose flour, 3/4 cup of quick oats, 3/4 cup of brown sugar, 1/4 teaspoon of salt, and 1/2 cup (1 stick) of softened butter. Combine with fingers or a fork until crumbly and then proceed with the recipe. If desired, replace the cinnamon with an apple pie spice blend. They Won't Believe This Dessert Pie is Made With Beans!